Welcome to the November Catalogue #204 which contains many sought-after titles. As we go to press we learn the sad news of the passing of the great SAS soldier Danny Wright. 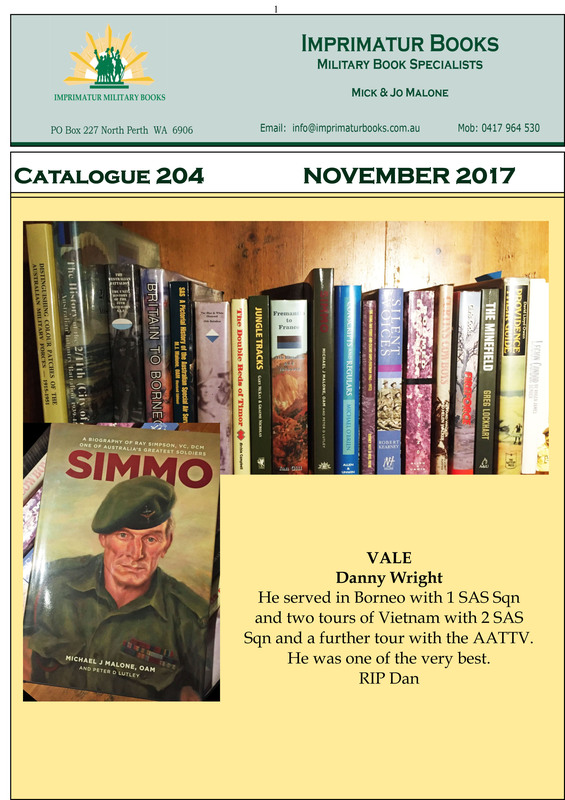 He served in Borneo with 1 SAS Sqn and two tours of Vietnam with 2 SAS Sqn and a further tour with the AATTV with his great mate Dave Scheele, DCM (RIP). He was known as ‘Dangme’ or ‘Jack from Wewak’ by most who knew him. He made his name generally in the military parachuting world and as a PJI, taught many of us gormless youths the finer points. He was one of the very best. RIP Dan. I’m very happy with the high quality of these books many of which are not often seen. In the main it’s to do with the size of the print run the author has decided on. If it’s only 100-150 then they will disappear overnight. And generally a revised edition reprint is not done due to a lack of funds and the gamble of getting left with them. The SIMMO book we did a year or so is a case in point. As this list comes out we see a daily dose of ‘SAS slamming’ generally by the Fairfax newspapers and the ABC. And Chris Masters writing a book about them is not at all helpful. This must stop now!! As usual I dedicate this list to those members who endure the slings and arrows of not only the bad guys but our own people as well. Lets hope we see some maturity displayed pretty soon.